In our Fall 2013 issue, we asked the project designers for their favorite organization tips. Here are their tips. We hope you can find some new ideas. I am a very visual person. My favorite tip is to keep your fabrics organized by color and easily accessible. Sometimes I find myself just staring at my stash (below) for inspiration. 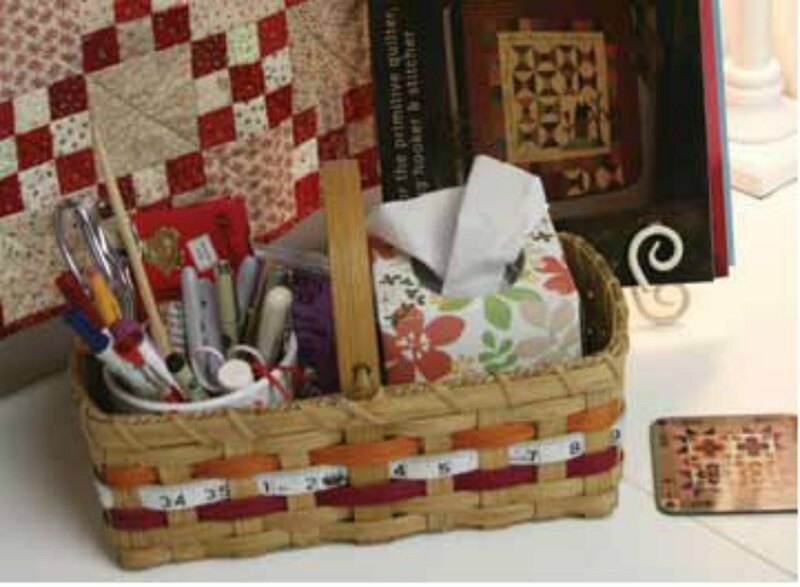 Like most quilters, I have a lot of stuff in my quilting studio. Although I struggle to keep things organized, I do have two solutions that I really love. The first is my fat quarter storage system. I can't take credit for this idea because I stole it from my friend and business partner, Nellie Holmes. To store my fat quarters, I use two shoe cubby storage units set up sideways. The fat quarters fit perfectly and I can keep everything organized by color. The second storage system that I love is basically a wide “ladder“ (right) made of dowels made by my dad. I can hang all of my seasonal wall hangings over it so that they don't get creased. As a result, they are easy to access when I need to do a trunk show or redecorate my home. As a child, I enjoyed organizing everything from fabric scraps to dishes. My childhood love of organizing continued into adulthood. I'm the one who has to have the labels all facing the same way in the pantry. While I've found useful organizational aids at the local quilt store, my favorite and most useful tools come from other places. For example, photo storage boxes are great for organizing fat quarters. Fishing lure boxes, which come in a variety of sizes, hold all sorts of fusible and stabilizing materials. And boxes made for organizing nuts and bolts are useful for holding balls of Valdani thread. Organized? What is that? Seriously, I am one of the least organized quilters you will ever meet. My old quilting space often looked as though someone had vandalized it. We recently moved into a new house and I have a much bigger space to work with. It has a huge walk-in closet with shelves all along the walls. This is a fantastic way to keep things neat, and best, yet, I can just close the door to hide everything when I need to. We are adding cabinets and a countertop, which will be great for all my art supplies, along one wall in the room. I love those plastic 3-drawer carts on wheels you can get at almost any store. I usually have several projects going on at once, so I designate a drawer for each project and keep all my templates, notes, thread, and fabric in it. Once the project is finished, I clean out that drawer so it is ready for the next project. The other nice thing about these carts is that you can move them around the sewing room easily. 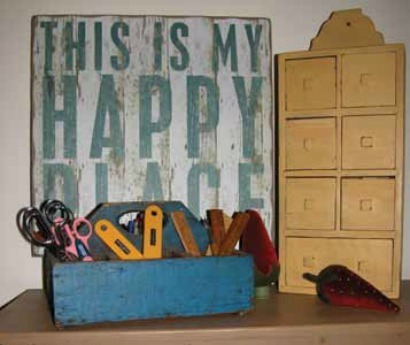 One of my favorite ways to stay organized in my sewing room is to keep a tool basket (above) near my sewing machine. In this basket, I keep tissue, hand cream, and chocolate for emergencies. I also keep a little pot with all my most frequently used tools, in addition to a pen, pencil, marking tools, chalk liner, tweezers, snips, stiletto, skewer, seam ripper, and small scissors. The things I reach for most often are easiest to find right in the basket, and they are very easy to toss back in the basket so they don’t get lost. After all, who wants to spend time looking for lost items when you could be stitching? For easy 10-minute organizational tips, visit my blog at butterflythreadsquilting.com/ search/label/10%20minute%20tips. I use an antique carrier and spice cupboard (below) to store many of my sewing notions. Not only are they practical, they are pretty pieces to have on display. The blue carrier has six compartments in which I store scissors, rulers, rotary cutters, pens, and pencils. The spice cupboard, which I recently painted a cheerful yellow color, has small drawers that are just the right size for sewing needles, bobbins, cutting blades, sewing machine feet, and quilt labels. Books, mostly related to quilt history, are also an important part of my work, and I store those in the bookcase below the blue carrier. Organization? I am embarrassed to say I think about it all the time but that is about as far as I get. However, this issue’s Designer Notes question prompted me to take a good look at something that has driven me crazy for a long time—my spools of thread, which were strewn about a plastic box along with phone chargers, cords, and various other items. To remedy the situation, I got some tie hangers from Home Depot. They hold my spools perfectly. Each rack holds 10 spools. The large spools will also fit on the tie hangers as long as you put a small spool next to them. The only drawback to this handy thread rack is that you have to make two holes in the wall for every tie rack used. I wanted a total of six tie racks, so that would have necessitated 12 holes in the wall! Luckily, I found the perfect solution—my husband mounted them on a painted 8" x 32" board (left). I enjoy doing a variety of needlework, which means I have a diverse assortment of materials and supplies to keep organized. Punchneedle is one of my interests, and I recently started using Valdani three-strand floss for a project. Valdani floss is wound into a ball, which is quite different than the way most other flosses are bundled. I found a container (below), which was designed to store beads, at my local arts and craft store. The Valdani floss just happens to fit perfectly in it. Organization is an important ingredient to be successful. I'm the kind of girl who needs a sense of order to be creative! I keep a file of ideas, collect fabric in baskets for specific ideas, and have a large antique laundry basket on wheels that corrals all my scraps. All of these elements provide inspiration for my scrap quilts and appliqué designs. 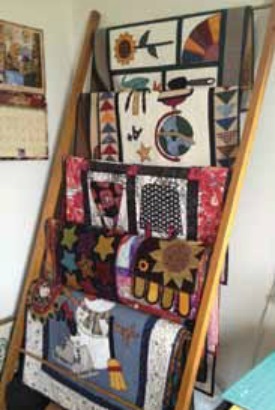 I have designed well over 100 quilts as well as quilted wall hangings and several rugs. To keep my patterns organized, I store each one in a large manila envelope, which contains all the handouts, supply lists, and templates of each motif. I store the envelopes in file cabinets and file boxes, and frequently refer to them for inspiration when designing a new project. When I am asked to teach a project or submit a design for publication, I simply go to my files, and everything I need is at my fingertips.